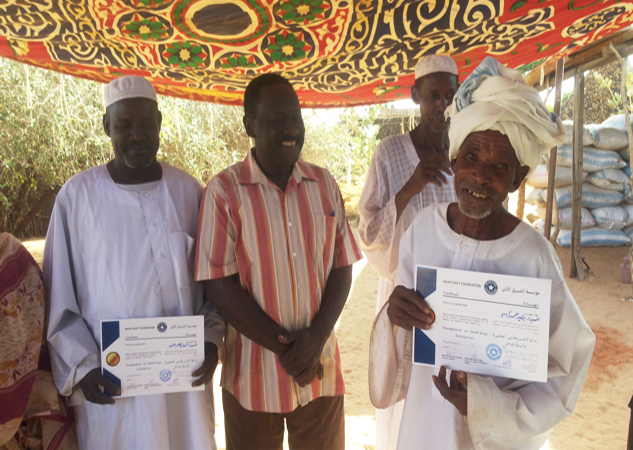 Eissa is 80 years old and a village leader in a remote village in South Kordofan. During his life, he has seen his village experience times of peace and times of great unrest caused by competition for territory and resources. He’s witnessed the resulting displacement and suffering these conflicts have caused as well as the degradation of the surrounding land and forests. Vital to NEF’s peacekeeping and natural resource management initiatives in the region are efforts to increase the role of women in public leadership and group decision-making around these matters. Ensuring that women have a voice in the peacebuilding process is key to achieving long-term changes in attitudes around the valuable contributions of women in their communities. Using an inclusive approach, the agreements are collaboratively established with the help of the Near East Foundation (NEF), the National Forest Cooperation (NFC), village leaders, village women’s associations, and local authorities. With funding from Comic Relief, it has been almost a year now since these conventions were put into place in three localities, all with positive impacts.